Tens of thousands of acres across New York State have been transformed into sprawling electric generating facilities. Specifically, some 18 industrial wind complexes house nearly 1,000 towering wind turbines that consume the landscape and threaten otherwise pristine communities. Now, consider that another 1,500 giant towers will need to be erected by 2015 in order to satisfy the state’s 30% renewable energy mandate. New York’s Renewable Portfolio Standard (RPS) can be credited with most of the wind development in the state. Officials insist the policy has helped New York diversify its energy resources and will ultimately lower electricity prices but such claims are more rhetoric than real. New York’s RPS has already exceeded original budget projections, it’s current renewable targets are unrealistic, and claims that prices will drop are predicated on a flawed understanding of how the New York wholesale power market operates. New York first enacted its renewable energy mandate in 2004 through regulations adopted by the Public Service Commission (PSC). At the time, about 19.3% percent of electricity retailed in the state was derived from renewable resources, with the vast majority coming from large-scale hydroelectric facilities upstate and in Canada. The PSC ordered the state reach a 25% renewables target by 2013 which meant an incremental increase of 10.0 million megawatt hours (MWh) from projects built after 2003. Unlike market-driven programs in other states, New York’s RPS uses a government-administered central procurement system to acquire renewable “attributes” from qualified projects. Projects selected through a competitive-bid process receive long-term contracts to sell their renewable attributes to the state. One megawatt hour of generation produces a single renewable attribute. These payments serve as an added revenue stream for project owners. Funding for the RPS comes from fees charged on the monthly electric bills of NY ratepayers. When the RPS was enacted, the Public Service Commission established a budget of up to $741.5 million to acquire the renewable attributes. It also defined yearly incremental RPS targets measured in megawatt hours. In a 2009 mid-course review of the program, a number of serious performance issues were raised. The program had nearly exceeded its entire initial budget while just half of the renewable attributes anticipated at that time were under contract. Other questions raised in the review involved the cost of necessary transmission to meet renewable goals and whether the program would ultimately reduce electricity prices as claimed. But rather than scale back the RPS or take more time to fully assess the program’s costs and benefits, the Commission insisted there were substantial qualitative benefits and ordered the goal increased to 30% by 2015 and the budget expanded. … to date, RPS costs have exceeded original projections, MWh targets have not been met, and the program’s administration remains unchanged. With this history, it is difficult to see how the expansion of the RPS will achieve the results desired. At the start of 2012, New York had 4.67 million megawatt hours of large-scale projects under contract representing about 2% of the state’s generation. 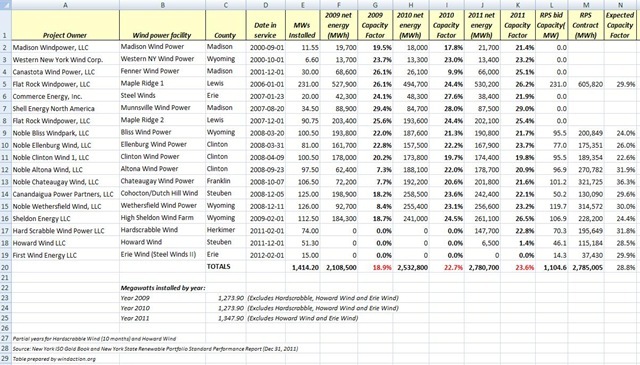 Most NY-sited wind energy facilities were under contract. In total, wind is the dominate fuel in the RPS, representing 80% of all renewable fuels. Since projects are awarded RPS contracts before they’re built, the state must estimate operating capacity factors on intermittent resources. For wind, if a project fails to meet a minimum obligation (80% of the contracted energy) for three consecutive years the contract amounts could be reduced. The Noble Clinton, Ellenburg and Bliss wind facilities were all reduced by one-third for this reason. We reviewed the contracted figures against actual production for operating wind projects and found that, in all but one case, the state significantly overestimated project capacity factors (see table). If the inflated capacity factors were adjusted downward to more accurately reflect wind’s poor performance, the state would need to contract even more generation to meet the mandates. In general, New York’s wind resource has proven marginal with annual average capacity factors ranging between 22-23% across all projects. State officials insist the RPS will reduce electricity prices through a mechanism known as ‘price suppression’ whereby renewables with no fuel cost displace more expensive power in the wholesale market. This argument may sound convincing but completely ignores how the wholesale market operates in New York. The New York power market uses a day-ahead auction where generators are required to offer firm levels of production for each hour of the next power day. The energy price, in turn, is determined based on those bidding into the system; all generators receive the same price per MWh of production. Significant penalties are applied if a generator is unable to meet his commitment. Because of its intermittency, wind typically does not operate in the day-ahead market preferring the real-time (spot) market which carries no penalties for non-performance. The real-time market represents less than 10% of available generation Since the price paid over ninety-percent of the generation is established 24-hours in advance, any participation from wind will have only a marginal impact on prices limited to the real-time market. Generators that bid in day-ahead who can back down are likely to do so to the greatest extent possible in order to save fuel and other costs. Since generators in the day-ahead market are still guaranteed payment, any price suppression from wind would be limited to the spot market. Thus, any downward pressure on pricing will go largely unnoticed. Ultimately, New York’s RPS will cost ratepayers billions of dollars to support the construction of new generation. And if the state continues to rely on wind as the dominate resource, more turbines will be necessary to make up for low capacity factors. The program is up for review again in 2013. It’s time for the PSC to remove the rose-colored glasses and acknowledge the program for what it is: Regulatory Capture at its finest. 1. NY’s RPS supports two tiers of projects, Main Tier and Customer-sited Tier. Main Tier projects include those built to meet grid-scale energy needs. Customer-Sited Tier applications support smaller behind-the-meter renewable generation. The bulk of the electricity needed to reach the RPS mandate comes from Main Tier resources. 2. Attribute prices ranged from as low as $14.75/MWh in 2007 to as high as $28.70/MWh in 2011. 3. The PSC forecasted 5.79 million MWh by the end of 2009. The state had acquired 3.03 million MWhs. 4. The incremental increase of only 0.4 million megawatt hours needed to reach the 30% target assumes that New York reaches significant energy efficiency goals aimed at reducing electricity needs in the state. If energy efficiency were not included in the analysis, the state would require 17.0 million MWh of new renewable generation to meet the RPS. 6. Actual annual generation (MWh) varies in NY due to the variable nature of renewable energy, including hydroelectric. Demand in NY also dropped since the RPS was enacted. Since the RPS was enacted, renewables in the state increased from around 19.3% to about 23% today, including all generation. With all the excitement of utilities buying Green Energy on the spot market, does anyone ever ask what happens to the fossil fuel generated electricity which doesn’t get picked up on the spot market? It is all very well for these agencies to play these stupid ‘thimble and pea’ games with where their electricity actually comes from, but they mostly miss the main idea of the game which is that they need to watch the thimble that has the CO2 producing ‘pea’ under it. There is no evidence to suggest that when wind turbines generate electricity that there is a concomitant turning down of fossil fuelled generators. In fact, they just generate electricity and produce CO2 as they normally would whether the wind be blowing or not, and if a utility doesn’t buy it from them, then they figuratively dump it on the ground. All this system engenders is waste and duplication and an chance for the sanctimonious to parade their stupidity in front of the rest of us. It is a long time coming, but these addicted to the ‘virtuous goodness’ opportunity that AGW presents to them will ultimately be also felled by it. Another fine post by Lisa Linowes. The only virtue I can see regarding New York’s RPS is that it includes impounded hydro. Since the state is not going to build anymore hydro dams, it will have to increase its RPS with either imported hydro from Canada or pretend that a lot more wind turbines will do the trick. I say pretend because New York needs capacity generation–and wind provides no firm capacity. I think Lisa could render even more service by offering, in a later post, a more complete explanation of the reverse Dutch auction process by which New York, and most other regions, bids for its electricity generation–both in the day ahead and realtime markets. Few understand the system; fewer still can explain it in ways that demonstrate what it hopes to achieve (by saving on consumer bills) and what actually happens. For example, how is it that natural gas generators, say, can get paid for generation it doesn’t deliver, thus saving on fuel costs? How is it that zero capacity generation like wind can “back down” high capacity generation, justified because wind has low fuel costs? In this, an explanation about economic dispatch selection would be very helpful. Charles, a quick point regarding the real-time market vs. the day-ahead market. All fossil generation within the NY-ISO service area is obligated to operate in the day-ahead market. The real-time market is largely limited to inefficient single-cycle gas plants, pump storage, landfill gas, small hydro, and other intermittent resources.